Citizen Eco-Drive men's dual time watch. The Citizen Perpetual Chrono has a daily alarm. Powered by Citizen's award-winning light-powered Eco-Drive technology it never needs a battery. 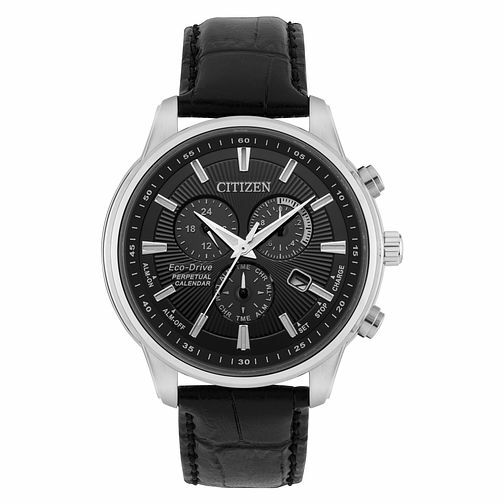 Citizen Men's Eco-Drive Black Leather Strap Watch is rated 5.0 out of 5 by 7. Rated 5 out of 5 by Anonymous from Excellent watch Bought as a present and the person whom it was for was over the moon with the watch nice looking no batteries neede no winding. It was truly good value for money I would definitely recommend it and others they have in stock. Rated 5 out of 5 by Anonymous from Great Very pleased with this purchase. Good quality, would recommend.